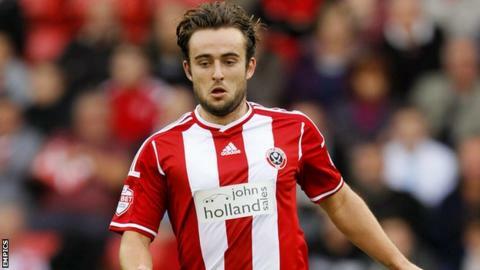 Jose Baxter grabbed a double as Sheffield United moved back in to the League One play-off places with a crushing win over lowly Colchester. Baxter bundled home the opener from close range and debutant Matt Done made it 2-0 after a glorious move that ended with him scoring with an angled drive. A classy long-range Jay McEveley shot brought a third Blades goal. And although Sammie Szmodics replied with a tidy finish, Baxter added number four from the penalty spot. Match ends, Sheffield United 4, Colchester United 1. Second Half ends, Sheffield United 4, Colchester United 1. Attempt missed. Dion Sembie-Ferris (Colchester United) right footed shot from the right side of the box misses to the right. Attempt saved. Kenneth McEvoy (Colchester United) right footed shot from the centre of the box is saved in the centre of the goal. Attempt saved. Chris Porter (Colchester United) right footed shot from very close range is saved in the centre of the goal. Substitution, Colchester United. Kenneth McEvoy replaces Gavin Massey. Tom Lapslie (Colchester United) wins a free kick on the left wing. Substitution, Sheffield United. Che Adams replaces Jamie Murphy. Goal! Sheffield United 4, Colchester United 1. Jose Baxter (Sheffield United) converts the penalty with a right footed shot to the centre of the goal. Penalty Sheffield United. Paul Coutts draws a foul in the penalty area. Penalty conceded by Gavin Massey (Colchester United) after a foul in the penalty area. Delay in match Robert Harris (Sheffield United) because of an injury. Corner, Colchester United. Conceded by Robert Harris. Goal! Sheffield United 3, Colchester United 1. Sammie Szmodics (Colchester United) left footed shot from the centre of the box to the top left corner. Assisted by Dion Sembie-Ferris. Robert Harris (Sheffield United) wins a free kick in the attacking half. Substitution, Sheffield United. Marc McNulty replaces Matt Done. Substitution, Sheffield United. Jason Holt replaces Jamal Campbell-Ryce. Goal! Sheffield United 3, Colchester United 0. Jay McEveley (Sheffield United) right footed shot from outside the box to the bottom right corner. Corner, Colchester United. Conceded by John Brayford. Substitution, Colchester United. Dion Sembie-Ferris replaces Ben Gordon. Delay in match Chris Porter (Colchester United) because of an injury. Second Half begins Sheffield United 2, Colchester United 0. First Half ends, Sheffield United 2, Colchester United 0. Delay in match Matt Done (Sheffield United) because of an injury.